To the casual observer, the sage brush country of the American West looks like the Big Empty--undisturbed land stretching to the horizon. So vast is this landscape that early travelers dubbed it "the sagebrush sea." The reality, however, is that the rich native biological integrity of this Inland Northwest ecosystems has been substantially diminished. And no single creature is better proof of this than the sage-grouse. The sage-grouse is a rather astonishing bird, best known for its flamboyant courtship displays. It is also a popular gamebird, which is part of the reason why wildlife officials monitor their numbers so assiduously. They are an excellent indicator of the health of sagelands because nearly every form of human activity in sage country affects the sage-grouse. Fencing, towers, and transmission lines give their predators the advantage. Resource extraction, such as mining and drilling, stress the grouse and render land unsuitable for mating and breeding. Farmlands and sage brush eradication destroy their habitat conspicuously, while livestock grazing and off-road vehicles accomplish the same end more subtly. Invasive species, especially cheat grass, render their landscapes more vulnerable to fire and simplifies the native plantlife, making food sources more scarce. The biggest worry, however, is not habitat destruction or fragmentation, but West Nile Virus, whose spread is abetted by gradual warming trends. The best study to date suggests that the birds are highly susceptible to the virus, and could suffer 100 percent mortality rates in the event of an infection. In Oregon, the sage-grouse report card is mixed. The good news: sage-grouse populations appear stable over the last 20 or 30 years. While their numbers follow a natural cycle of ebb and flow, biologists believe that their current numbers reflect population stability. The bad news: current populations are substantially below their historic abundance. Sage-grouse numbers today are probably less than 1/4 of their historic numbers, and less than 1/2 of what they were at mid-century. Unfortunately, in Washington, the future of the sage-grouse is less rosy. Though Lewis and Clark reported a "great abundance" of sage-grouse in east-central Washington, especially near present-day Tri-Cities, the state is now home to only about 1,000 birds, in two fragmented populations. 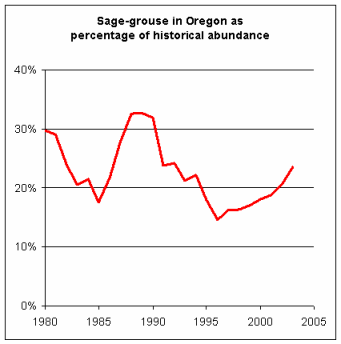 In fact, despite their former abundance, the long-term prospects for sage-grouse in Washington look grim. I just wanted to say I'm enjoying the Wild Kingdom of Sustainability approach. Salmon, wolves, and grouse, oh my. Keep it up!